We save you time, money, and CSA points! 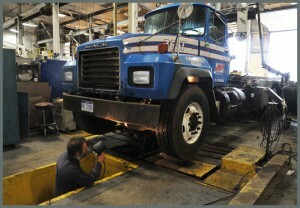 VIS Check is a diagnostic machine that checks the brakes, steering and suspension of heavy trucks. A Safety and Efficiency Report is then produced to guide our maintenance staff. We can find brake, steering and suspension issues in minutes, not hours. With our Automated Brake Test we can test foundation brakes to make sure they meet federal requirements. Our Road Simulator recreates road conditions safely in our shop. Why Focus on Undercarriage Diagnostics? The undercarriage of a vehicle is where the weight of a vehicle meets the road. Safety, fuel economy and tire life are all compromised if the undercarriage components are not in top working condition. 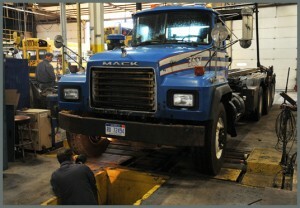 The undercarriage issues could be costing you time and money if not properly taken care of. Why Use a Machine to Preform Undercarriage Diagnostics?